On average a commercial or industrial roof is expected to last for 20-30 years until it is no longer thermally efficient and the maintenance costs begin to soar. This means that if it is older than that then you will most likely be losing energy (and money) through the inferior insulation and repairs to damage and leaks when the wet weather arrives. It is best advised to act before conditions deteriorate too much and repair costs are non-negotiable. This blog will address the various reasons why you may want to consider reroofing your property, and the options that are available to you. Appearance counts for everything when you are trying to attract new cliental, regardless of the industry or line of business you are involved in. If a potential client approaches your building and they are greeted by a modern and well presented facility, then that will create an immediate positive impact before they have even walked through the door. There is a wide variety of roofing options available to you to make your property stand out; and being industry experts; Sage BEC (formerly Sage Roofing) can help you pick out the option which suits you. We also offer exterior Cladding as well as providing the roofing services, giving clients the opportunity to have a full make over from top to bottom. For examples of our previous work, have a look at our Project Gallery. The recent ‘Control of Asbestos Regulation 2012’ identifies that any building; domestic or commercial which is found to have asbestos present is required to be assessed; then if necessary, have it removed. Asbestos comes in different forms and not all is required to be removed if it does not pose a health risk to those working within the building or others. Instances relating to asbestos can be relatively broad, so if you would like more information on the topic then visit the HSE Website. With a greater impetus for companies & businesses to manage themselves in a more environmentally considerate manner; the thermal efficiency of the building is an ideal place to start. There are a variety of different methods by which the thermal insulation of a building can be improved and better controlled. This will not only help to reduce the building’s carbon offset, but can also help to save money through reducing heating and energy bills. Below are a few examples in which you can make your building more environmentally friendly whilst benefiting your business. Insulating your commercial building can have a really positive effect upon the property in lots of ways. The most obvious way is through improving energy efficiency. By insulating you can significantly reduce heat loss, therefore reducing the heating costs. This has a positive impact environmentally as it reduces the amount of carbon which is consumed; and by insulating you can also help the environment through noise reduction and sound-proofing. Insulating your property can also help to extend the life of the roof as it adds stability to the structure, making it more durable in diverse conditions. There are many different types of insulation available for different types of roofing structure. Contact us directly to get a better understanding of what would be best suited to your business. Through the government’s FIT scheme you can potentially save large amounts of money through the installation of solar panels, but it comes with a catch as there is a limited budget to how much the government have invested into the scheme. 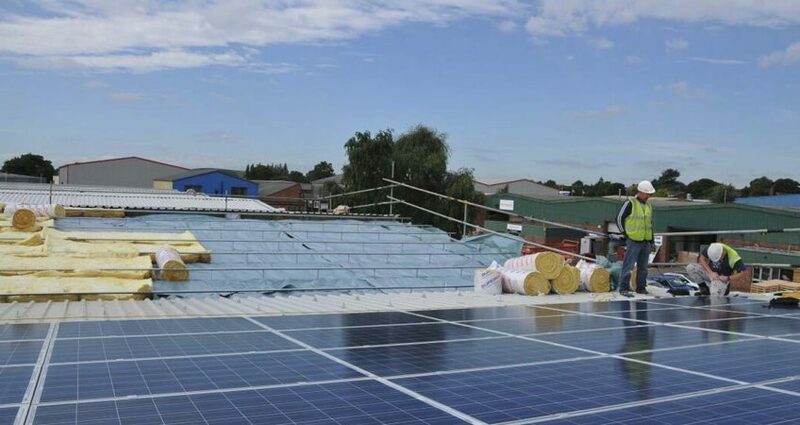 Therefore, it would be best to act now to get the greatest benefits from the scheme and you will find that by over cladding the roofing unit and installing the PV panels; the return from the solar panels will almost pay for the cost of roofing & installation over a 20 year period*. Speak to the Sage team for more info. Sage BEC (formerly Sage Roofing) is a fervent supporter of green roofing due to the potential that it has in not only aiding the environment through carbon reduction, but it also has great advantages in other less obvious ways. It has been statistically proven that green roofing can help to reduce the general temperature within a building by absorbing the heat from the roof. What this means is that the requirement for air conditioning in warmer temperatures is reduced thus lowering energy costs (which can be increased by up to 20% through air conditioning in certain months). It is worth mentioning that the effects of green roofing are neutral in more ambient and cooler temperatures, and in fact can act as a form of insulation when the climate is cooler. Green roofing is also great for the local community and environment in wet conditions as well. Green roofs can store up to 5mm of rainwater run-off, which helps to alleviate the pressure on storm-water drainage systems and can potentially help to reduce flooding and pollution risks to rivers and water supplies. Further to this, Green roofs can actually help to enhance the lifespan of your roof by protecting it from UV sunlight and differing weather conditions (such as frost), and they are known to endure for up to two or three times the length of a normal flat roof. Should you desire any further information relating to green roofs, do not hesitate to contact us and we would be happy to supply it. These are just a small handful of reasons why you may want to consider reroofing or renovating your property. Other reasons may vary greatly, but either way Sage BEC (formerly Sage Roofing) offer a wide range of bespoke services to cater for the specific requirements of our clients, so feel free to contact us with any enquiries or general questions relating to your roofing needs.